Commercial vehicle tyres are increasingly being fitted or repaired out on the road, to the benefit of fleet operators. After all, a mobile operation is far more convenient; taking the service to wherever vehicles are located reduces downtime for the customer and gets drivers back on the road as quickly as possible. And the savings can be significant – in fact, Volkswagen says that unscheduled downtime can cost fleet operators more than £600 a day*. A mobile tyre technician will obviously need a fully functional van, containing the tools and equipment they need for tyre fitting and repair work. But the other essential requirement is access to compressed air. The technician can carry a separate compressor in the back of their van – but this takes up valuable space, and can be hazardous if it’s not properly secured. They will also need to ensure a fuel or power source is available wherever the customer’s vehicle is located, which can be difficult if it’s on the side of a road. 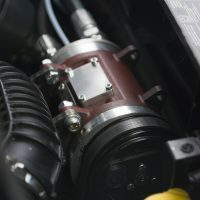 The alternative is on-vehicle power, where a vehicle is professionally converted so that the power of the engine is used to drive auxiliary equipment. On-vehicle power systems can provide compressed air, as well as electricity, hydraulic power and high pressure water jetting. And, compared to the traditional approach of using separate plant to provide power, they offer many benefits. Importantly, vehicle utilisation is significantly improved. The technician will essentially be driving a mobile work station; they will have everything they need to carry out tyre repair and fitting work within their vehicle, especially if racking, workbenches and lighting are fitted too. In addition, eliminating the need for a separate compressor reduces operational noise levels and emissions, meaning employees benefit from a safer, cleaner working environment. One of our customers that is reaping the benefits of investing in on-vehicle power is Tructyre Fleet Management. When the company started a mobile commercial tyre service provision for truck fleets in Hampshire in 1996 it worked from a single depot in Winchester and had just two service vans. It now operates 126 vans from 24 locations across the southern regions of the country. Of the 126 vehicles, 120 of them have Winton systems fitted, and by the third quarter of 2017 the whole service fleet will be using Winton on-vehicle power. Scott Matthews, logistics and fleet executive/group transport manager for Tructyre Group of Companies, explains why the company uses Winton on-vehicle power: “As Tructyre has grown, Winton has grown with us, and this has built a stable foundation for our partnership. Winton has listened to our requirements and needs, and has kept up with customer demands now and into the future. “Up until the third quarter of 2016, we used the tried and tested PTO operated drive line power take off with an M80 compressor. This system worked very well for us, but we’re always looking for new and innovative ways to improve systems and efficiencies, and to control operating costs. After meetings with Winton, we trialled a new engine mounted compressor system, and the Mattei M75 rotary vane compressor was installed to a newbuild Mercedes Benz EU5 Sprinter. It was put to test in real-time operating practices, doing the same work as the previous system. We instantly received good feedback from the operator, and after a three-month trial the system had proved to be easier to operate, quieter, lighter and more fuel efficient, and lowered capital costs. “The Mattei M75 system ticked all the boxes, and with the data gathered we could see a fuel saving improvement of +2.4 mpg average. The next stage was to introduce this system to a newbuild Mercedes Benz EU6, which we took delivery of in January 2017 to complement our service fleet. Along with the on-vehicle power system, the installation includes a purpose-built work bench, LED roof lights, LED work lights and an inverter. It’s important to mention that on-vehicle power systems should be installed and certified in line with manufacturer guidelines and, where applicable, to EUWVTA UK National Small Series Type Approval (NSSTA). Type Approval means the vehicle installation conforms to current legislation, meets legal requirements and will add value to the vehicle resale in years to come. The impact that a conversion will have on payload also needs to be considered, especially now that extra technology – and additional weight – is being fitted to light commercial vehicles to meet Euro 6 emission regulations. Through practical innovations, Winton has been able to attain a lower total weight for our systems, but without compromising the integrity or undermining quality. Tyre technicians need access to compressed air, and on-vehicle power can be the ideal answer for mobile operations, helping to create a workstation that has everything they need while they’re out on the road. Winton’s on-vehicle power systems can include a compressor, generator, inverter and/or hydraulic power, alongside a range of ancillary equipment, including racking and workbenches, external light bars and work lights. They can be fitted to a wide range of commercial vehicles, from light commercial vehicles to 26 tonne lorries.